Today, I will continue on with my Fields of Dreams blog series. 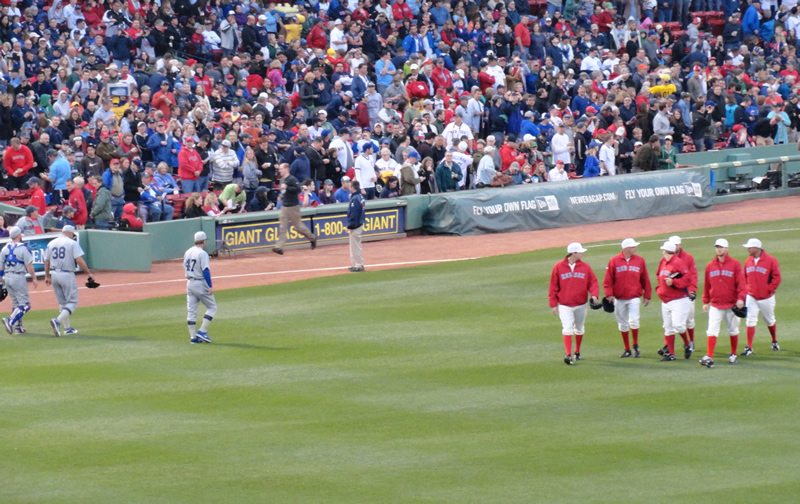 In my last post in this series I talked about the first Cubs vs. Red Sox game we went to, and what a shellacking it was. Friday night after game 1, we didn’t get back to the hotel till around 1:00am. 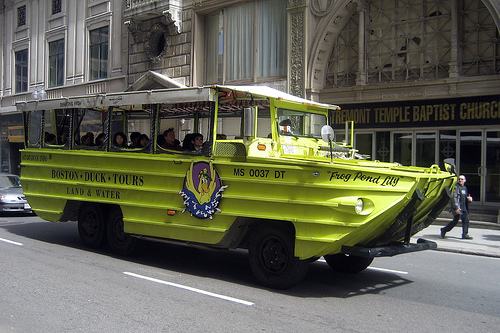 On Saturday, we got up and went on a Duck Tour of Boston, which was a lot of fun. After we finished riding a duck around, we met up with my friend Matt. He gave us a walking tour and took us to a cool coffee shop called Thinking Cup (where I had a nice cup of Kenya from a Bee House). After that, we went to Fenway for a tour. The tour was fun, and we got to watch some of the Red Sox batting practice. After the tour, I looked for a t-shirt for Jen. 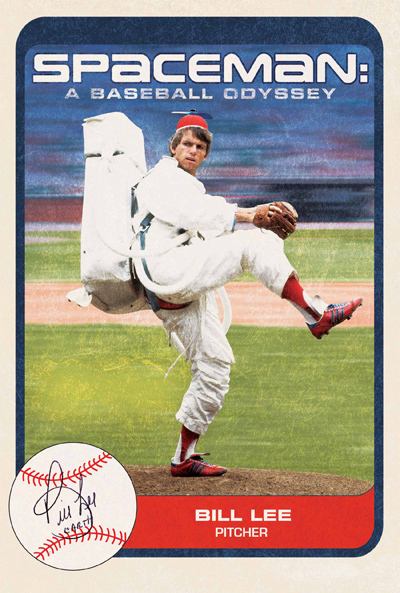 While walking down Yawkey Way, I ran into Bill “Spaceman” Lee. He was very friendly – even though I was wearing all Cubs gear. Once again, I waded my way through the crowd to get close to batting practice. This time I changed my strategy and went to left field. I was really hoping to get Kerry Wood to sign a ball, but he never came close. I did, however, get to meet 1984 Gold-Glove winning Bob Dernier. He was super friendly, and he signed stuff for a lot of people (would you really expect any less of a teammate of Ryne Sandberg?). Now onto the game. The game was great. They decided to celebrate that this was the first series these two teams played at Fenway since 1918 by wearing throwback jerseys. Carlos Zambrano started for the Cubs and Alfredo Aceves started for the Red Sox. We were seated in center field for this game, and it was great. Whereas Boston had jumped out to an early lead the night before, this game started off pretty even. The first play worth noting was an awful HBP. In the second inning, a fastball got away from Aceves and hit Marlon Byrd right below the eye. It hurt from where I was sitting. It was a really scary moment, and Byrd got taken to the hospital immediately (he is ok now, and hopes to return to play in a couple of weeks). The Cubs took a 1-0 lead in the third, but then the Sox went up 2-1 in the fourth and 3-1 in the sixth. I thought for sure the Cubs were going to hand this one in too, but then the 8th inning came. The Cubs scored 8 runs in the eighth inning to make it a 9-3 game. It was beautiful. The Cubs held on to win, and I was very pleased. One interesting feature of the night was all the references to the 1918 World Series. 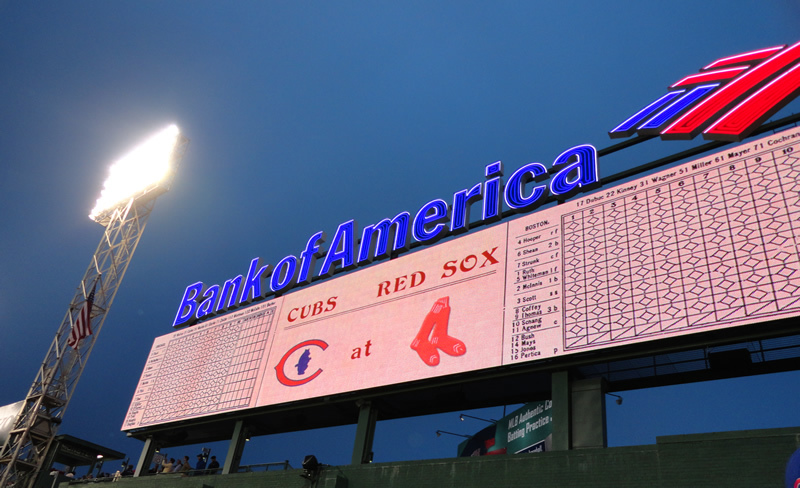 In honor of that series, Fenway Park regressed to 1918 technology for two innings. That meant: no broadcaster announcing names of batters, no digital pitch count or mph for all to see, and the only ball/strike counter was on the Green Monster. I was keeping score throughout the game, and I became really popular at this point in the game. It was amazing how quiet the whole park got. Everyone was intent on watching the game, because they had to in order to know what was going on. I really liked it. Overall, it was a great experience. I loved Boston. The Boston fans were still friendly, even after the Cubs laid it on the Red Sox that night. I like Boston as a city, and I recommend that you visit if you haven’t already. Stay tuned for a post on my first trip to the Bronx.